Hello, my name is William Aiken. 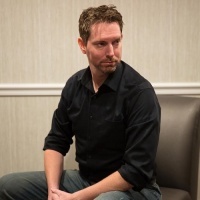 I've personally served hundreds of entrepreneurs with their traffic needs with the primary purpose to help them achieve the absolute best results. Your success is my primary goal! ☑ Guarantee Real Traffic, Triple Filtering: Autoresponder Filtering + Clickmagick (The #1 Traffic Delivery & Filtering Platform) + Udimi's Amazing Filtering System! See The Results Below Of Some Of The Latest Happy Customers Of Whom Most Received SALES! I provide top tier traffic to biz op list building forms ONLY. (Landing Pages) I do not sell traffic DIRECT to sales pages. Your forms should be professional and SINGLE OPT IN. Landing pages that only ask for the email address convert the best. If you ask for name, phone number and etc, your conversions will drop significantly. My traffic performs extremely well for most biz op offers. Offers that are over the top or looks ridiculous will be rejected because I hold a level of integrity to my list and what my subscribers are truly interested in which is good quality business opportunity offers. Great solo! 29% opt in rate. Overdelivery 25 clicks! Thanx William! 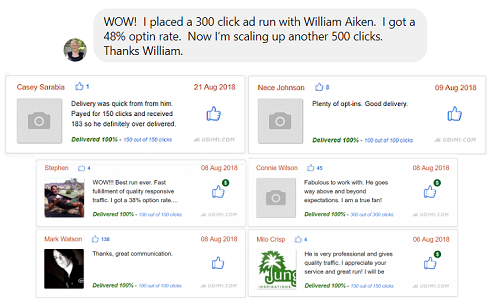 William produced 94 leads with over 50% opt-in. No sales yet. Great job! Will definitely use him again.!! William was great to work with. I ordered 200 and received 230. Thank you for the over delivery. Always Great Run! No sales yet, but they will come! William made sure he stayed within my budget to help me get the traffic that I need. He was very informative and helped a lot. I will be back. Seller sent fake traffic, probably people being paid to submit email addresses. See video proof attached. Delivery was quick from from him. Payed for 150 clicks and received 183 so he definitely over delivered. 19 clicks came from Germany strangely enough. Great solo run Will, whole lot of leads, but no sales yet. Its only a matter of time, defienetly will be back for more! Plenty of opt-ins. Good delivery. Thanks, great communication. Decent solo. Fabulous to work with. He goes way above and beyond expectations. I am a true fan!